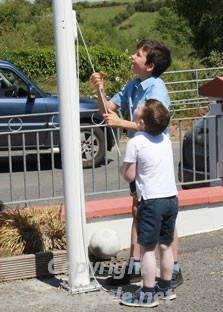 When one talks about 'Flag Day' one thinks about people standing at crossroads, at traffic lights, at entrances to shops, at the doors of the Banks and Post offices, at any point where the public might tread. 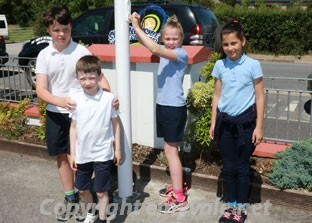 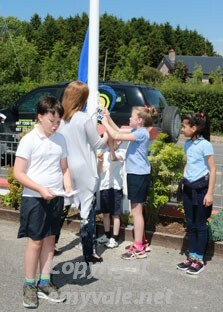 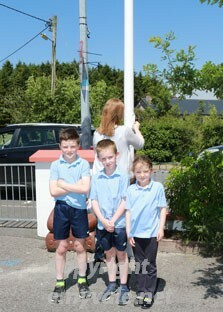 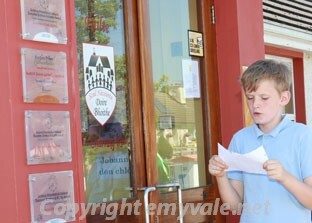 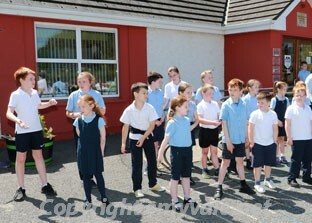 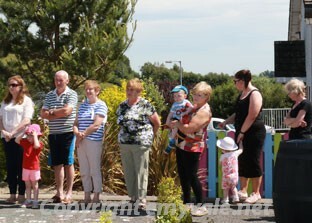 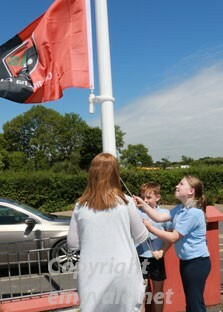 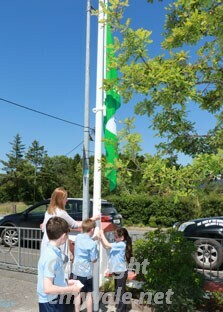 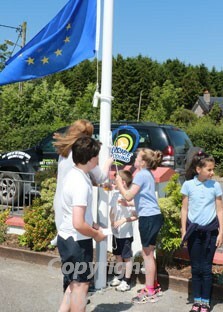 However in this case that is far from the Flag Day held at Deravoy NS on Tuesday, June 26th. 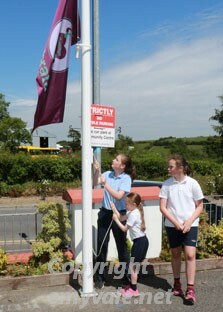 Six flags were raised and they represented a year of work, of study, of activity, of developing new skills and displaying skills perfected, of recognising projects completed, of recalling great memories of the school year, of personal achievements, of support from so many quarters and especially from families, of friendships formed and friendships strengthened, of holidays ahead and, for some, the move to a new school and a new experience in September. 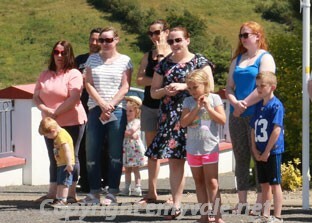 The event began with a selection of music played by pupils and then pupils, (the eldest and the youngest), who represented projects they had been involved in, raised the Flags one by one. 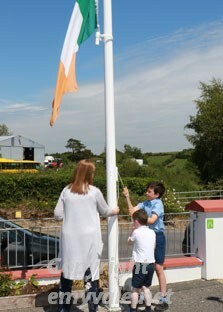 There was the Green Flag, The Blue Flag, The Truagh Flag, The Flag for Gaeilge, the Monaghan Flag and the National Flag, which was followed by the singing of Amhrán na bhFiann. 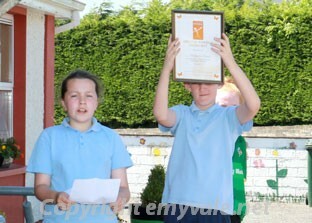 Recognition was also given to other projects which the pupils had been involved in and received awards and the children sang for us with gusto and actions. 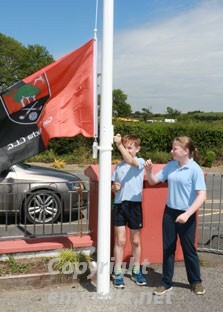 Our congratulations to all concerned. 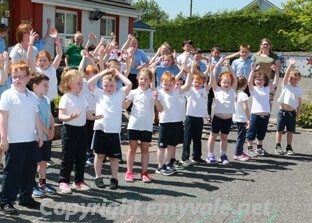 It was a lovely and very positive way to bring the School Year to a close and it sets the targets for the one to follow. 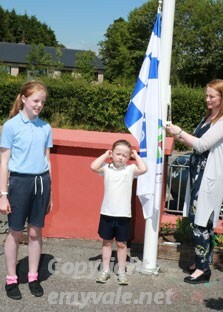 We wish the staff and pupils a lovely enjoyable and safe holiday and hopefully I will be able to see those who return in September and that those who move to second level will enjoy and succeed in what they take on to do.